James Wan is usually associated with the Saw franchise, even though he only directed the initial installment in the long-running horror franchise. After that, he started exploring more traditional ghost stories in an effort to unnerve his audiences. Insidious remains one of the creepiest films I’ve seen in recent years, so I’m anxious to see how Wan follows it up with The Conjuring, a haunted tale he recently filmed in Wilmington, N.C. The most revealing notion of these new photos is that it sets up the period setting of Wan’s story. The Conjuring takes place in the 1970s, which you probably could tell based on the clothing on Ron Livingston and Lili Taylor, playing the terrified parents who summon the spiritual investigating Warrens to their home. 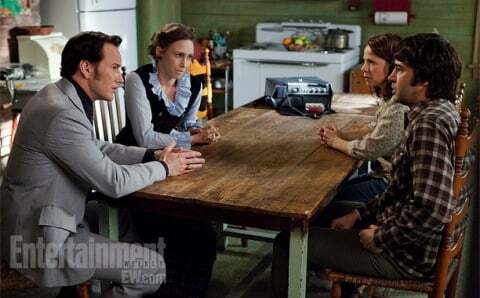 The Warrens are actual people, though, and the Conjuring script reportedly pulls its information directly from case files that you can read regarding the couple’s investigations into strange happenings around the globe. And there are many case files, meaning Warner Bros. and New Line Cinema might have a potential “Warren Files” franchise on their hands if enough audience members respond to The Conjuring when it opens on July 19, 2013.